Originally posted on Culinary Wannabe – this is one of my favorites! We have had a busy week packing up the fam to head down to GA for my little brother’s wedding, so I thought I would share one of my all time favorite Fall go-to’s that I’m sure you will love. 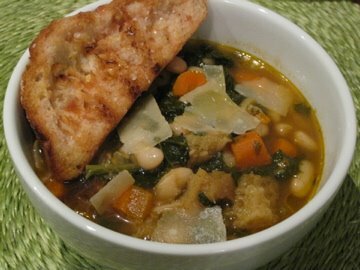 This soup is loaded with veggies and beans, possibly making it the healthiest thing I’ve posted to this blog thus far. But that’s not the reason I love it – I love it because it tastes amazing!! It’s a slow cooker recipe, so the prep is a cinch. Go ahead and whip up a bowl of this delicious and soul satisfying soup this weekend. And even though there already are some scrumptious little bread pieces in there, I just can’t have a bowl of soup without some crusty bread to dip into it. So here’s my recipe for tomato bread – so yummy and the perfect compliment to this soup. Hope everyone is off to a great Fall! Warm olive oil over medium heat in a frying pan. Add onions and garlic and cook for 5 minutes, or until softened. Stir in tomato paste and cook for an additional 2 minutes. Add broth to the pan and bring to a boil. Remove from heat once the liquid begins to boil. Place beans, kale, carrots, celery, and thyme in slow cooker. Add 2 teaspoons of salt and 1 teaspoon of pepper. Cook in slow cooker for 4 hours on high or 8 hours on low. Stir bread into soup about 10 minutes before serving. Season to taste with additional salt and pepper. Optionally, each serving can be drizzled with olive oil and parmesan shavings. Lay the slices of bread over a hot grill pan for a few minutes on each side until they are toasted and have nice markings. Rub each piece of toast with a garlic clove then the cut side of the tomato half. Drizzle with a little bit of olive oil and follow with a sprinkle of salt. Posted in Dinner, Recipes, Slow Cooker and tagged beans, bread, dinner, slow cooker, soup. Bookmark the permalink. Hi, I’m Ashley! I'm a city mommy, runner, foodie and shoe lover. Thanks for visiting with me! This looks so good. It is soup weather and I like bean soup of all kinds.